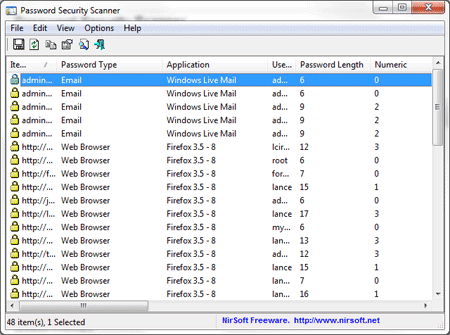 Password Security Scanner is a Free Portable Password Testing tool created by NirSoft. It can be used to test the security of passwords stored in your web browsers, messengers, and email clients. Detailed information of every stored password such as total number of characters, number of numeric characters, number of lowercase/uppercase characters, number of repeating characters, and password strength is displayed, without revealing the actual passwords.